It’s my favorite kind of salad! 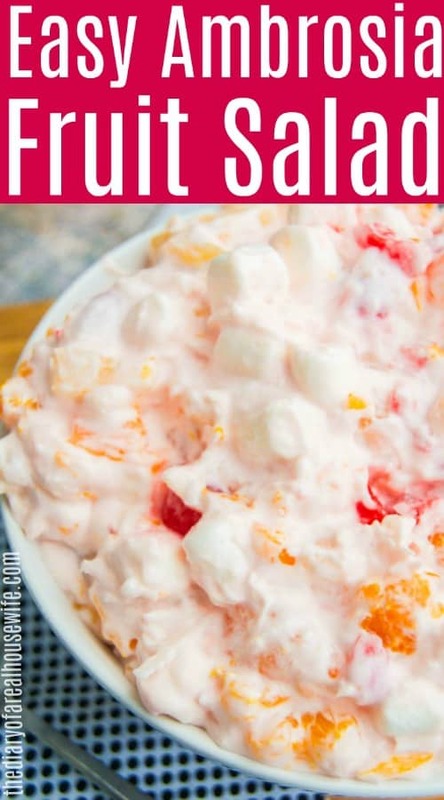 Full of fruit and covered in cool whip, this Easy Ambrosia Fruit Salad is a must try! When I told my kids we would be having a salad for dessert after our dinner last night their reaction wasn’t that of pure joy. More like, the salad really mom? 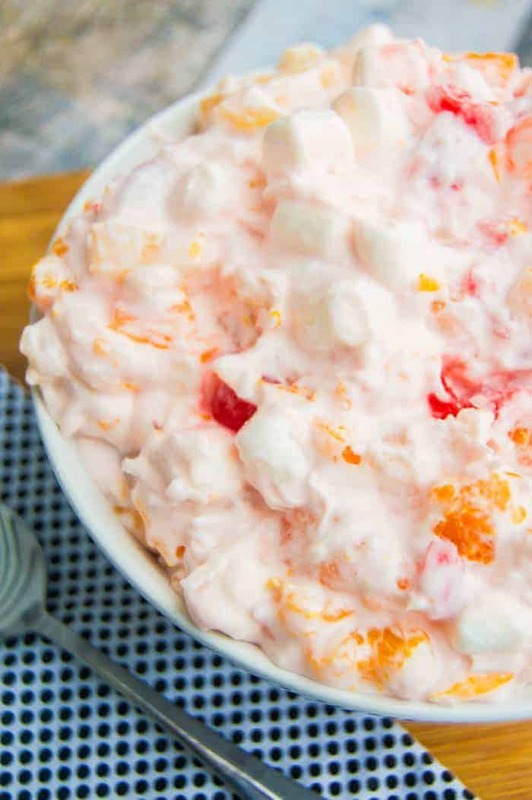 When the salad is filled with fruit and marshmallows then coated in creamy cool whip, well that’s a salad any kid would agree to eat! 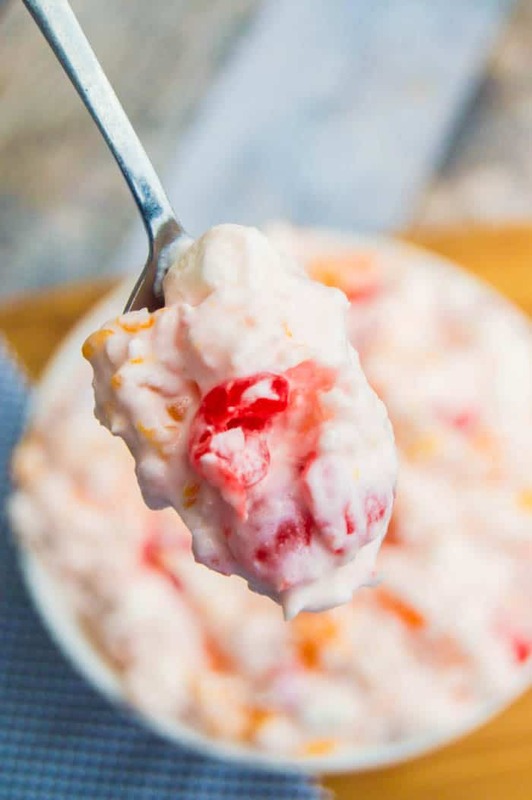 This Easy Ambrosia Fruit Salad is a must try and a winner with the entire family. We love it as a treat and it’s the perfect sweet side for the holidays. I mixed that with marshmallows, cool whip, and sour cream. Drain all canned fruits and place in a large mixing bowl. Add mini marshmallows and coconut flakes. Gently fold in cool whip and sour cream until well combined. I like to serve mine chilled. Drain all canned fruits and place in a large mixing bowl. Add mini marshmallows and coconut flakes. Gently fold in cool whip and sour cream until well combined. I LOVE this stuff! Both my mom and grandmother would make it! 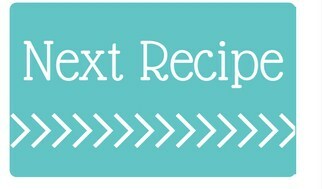 I don’t think I have their recipe, so I will for sure be using this one! IT’s so yummy!! Thanks Ashley for coming by!! Hope your doing well! Hi!! I’m excited about this recipe but can you tell me if it is ok to make a day ahead or will it get too loose? Don’t like Sour Cream!! AND U used oranges!! You could always skip the orange and sour cream! Maybe add another fruit you enjoy. Hope you try other recipes, thanks for letting me know.